The relationship between Yelp and consumer behavior is obvious, and there are plenty of research infographics to back up the claim. These infographics show how Yelp influences everything from local purchases to holiday shopping. If your business isn’t on Yelp yet, then these visuals should convince you to create a listing. When you’re ready, check out our claiming guide and everything else you need to know about Yelp for Business. Yelp commissioned multiple studies from Nielsen including this 2016 study, which looked at Yelp and its role in the purchasing process. The study asked 2,000 consumers about their purchase intent and found that 92 percent make a purchase after when they sometimes, frequently, or almost always visit Yelp. Furthermore, a majority of those who decide on a purchase (79 percent) do so within a week. A smaller group of consumers – 42 percent – will make a purchase within a day. The same study also showed that 74 percent of consumers use review sites when searching for a local business. The importance of review sites is also reflected in three independent studies from Software Advice in 2015. Most people think of Yelp as a source for information on a restaurant, but it also features listing information for other businesses. In fact, the studies revealed that Yelp is the first choice for those looking for reviews on a doctor, lawyer, or home service provider. The study on doctors showed that 61 percent of consumers use online reviews before they select a new doctor. The practice of using online reviews to find a doctor exploded in 2014 with 42 percent of patients using reviews as a form of research. In 2013, only 25 percent of patients used reviews to find out about a potential doctor. 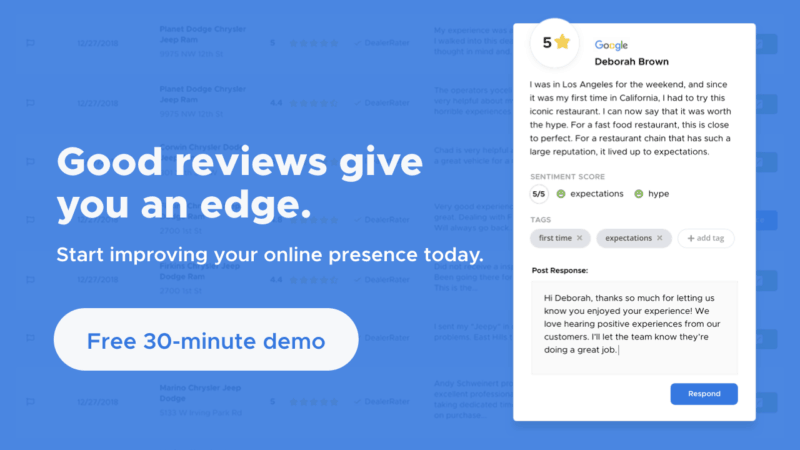 Online reviews are the first step for 83 percent of potential clients, and Yelp holds a 58 percent majority as the most popular site for attorney reviews. As of February 2015, the study revealed that over 500,000 visits to an attorney’s site came from a Yelp business page. Yelp served as a trusted source – more than Angie’s List or the Better Business Bureau – to the tune of 74 percent of consumers that used a review site to find home services. More than 50 percent of consumers used Yelp to find cleaning, electrical, pest control, and plumbing businesses. Holiday shopping is in full effect and another Yelp-commissioned Nielsen report from 2014 showed that local businesses thrive during the holidays. Specifically, 8 in 10 Americans were likely to shop at local businesses during the holidays, and 47 percent of that group planned to spend more than $100. Another 2014 infographic from Nielsen cemented Yelp’s position as a top review site. When compared to sites like TripAdvisor, Angie’s List, CitySearch, and YP.com, consumers found Yelp to be the most influential, trustworthy, and highest-quality reviews. The survey also revealed that 44 percent of consumers used Yelp. TripAdvisor, which was in second place, was only used by 12 percent of consumers. A 2013 Nielsen provided insights into user behavior on Yelp. An overwhelming majority (82 percent) were using Yelp with the intention to buy a product or service. Most users at the time were still using Yelp for restaurants with beauty and spas, food, nightlife, and home and local services making up the top five searches on Yelp. January 2013 was a milestone for Yelp because it was the first time that the site recorded over 100 million unique visitors on the desktop website in a one-month period. During this time, over 9.4 million unique mobile devices used the Yelp app. A total one million reviews were created during the month and 61.3 of the photos added in January were uploaded through the Yelp app.